Time for a change of scene, methinks. Last edited by mscha on Tue May 07, 2013 2:07 pm UTC, edited 2 times in total. I think next time I parse the forum I will have to figure out the time correction amount based on the first post and apply to all parsed dates. Oughtadoit. The recent dialogue has me wondering whether this is all a global warming metaphor. mekily wrote: The recent dialogue has me wondering whether this is all a global warming metaphor. but the castles are made of snow! I have a contribution for the Soundtrack of Time. Does Anybody Really Know What Time It Is?, by Chicago. The song is awesome. Though, huh, it probably has the most I've Seen Your New Haircut lyrics on the entire thread, so here comes, fixed lyrics or something. About time (Oh yes, yes) I do care! Thanks StratPlayer! I'm... huh... used to the paradoxes, do I really need to be cured of them? Well, then bring in the Paradocs! "...by a pair of docs." I fully agree with this! It also makes me afraid that 50 years from now, I'll be the only person following it... Nahhh. Then solobutterfly is severely bashed by religious people, because there's no other comics like this. There's no other comics period. But I understand solobutterfly's sentiment and agree with it, we're now all part of history! Comic reaches color #252525. Looks about 50% dark to me, though, painting it 50% grey side by side, it does look a bit darker. Goggalor says he's been relaxed and calmed by the new pace of the comic. I, for one, can't wait for the fading to end - Okay, I can and I will, but you know what I mean. RobIrr's image gets 2000 more views since I bumped it. ChronosDragon wrote: Some predict that at the end of Time, all loyal TimeWaiters will be gathered together in eternal rejoicing and Waiting, and all who ever Waited shall be reunited as one people on the New Forum. Yay! But wait, by then, we'd have had already waited for it, for what would we then be waiting for? #2E2E2E reached - Looks way too bright, something must be wrong. And there is! MSPaint informs me what I'm perceiving is #767676. *Kicks Firefox* STOP THAT! Latent22 posts new graph that predicts the ending of the fading. Will it end at frame 960? Or at frame 963 like cmyk said? None of them? Then, I find in horror that tman2nd and lmjb1964 have been lost in the past! Oh no! I'm catching up so that we can spend some time together! The present will not be the same if I ketchup and you're not there. Good luck with blitzing, and Randallspeed! 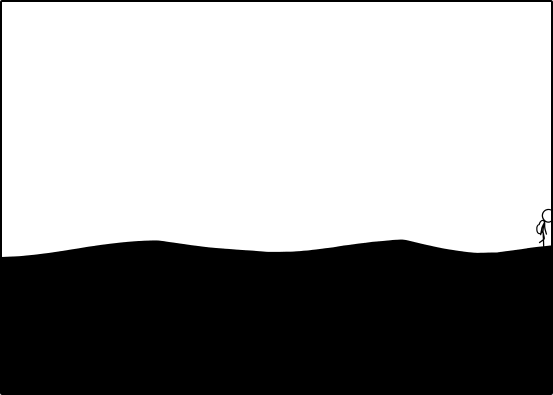 cmyk wrote: When the dissolve is complete, the scene will fade back as M&C will return to their sand castles much eroded or something of the sort. Oh, I like this theory. I've been annoyed that Randall's pace is so slow, and nothing's happening, but if he had drawn all the comics of the erosion of the castles, and then at some point decided that he'd just speed it up by fading to white, then that's fine with me! I'll not be stuck for months seeing how they erode! Tatiana posts suggestions for things to do with our lives now that the OTC is fading away. Thanks, added to Bookmarks. I guess while it fades to white I'll continue to ketchup. higgs-boson posts farewell. Oh no! Please wait with us! I can't resist and spoil myself checking higgs-boson's posts. Phew! Xey'll be back! I pass a confusing SignPost by DrSamCarter, which may be his first post on the thread, or the third. Here he edits-sends message from 5 pages from the future, spoiling that BlitzGirl will be back, but eh, I know BlitzGirl will had ketchup, so she had to be back eventually. RobIrr rebumps his image. I like numbers that keep raising, to I'll start reporting xkcd.irrelevant's progress when I see it: Right now 8307 Visitors. Spaceman Spiff wrote: Also, go BlitzGirl! And go Vytron! We believe in you! Thanks! I also believe in all the TimeTravelerFollowers! azule posts Firefox fix so I no longer see the pixels of the comic much brighter than supposed to. Many thanks! I read Valarya's sigcouragement: Thanks! Then, BlitzGirl appears in the comic again! Maybe she hasn't been posting on the thread because she was finding her way to the comic! tman2nd called it! Also, maybe this is what DrSamCarter was referring to, ah! Also, another Synchronicity, descor makes xeir post #100 as I see xey just passed #200 in the present! Progress through the Credits: Place 155 2 Posts Ago. Last edited by Vytron on Thu May 30, 2013 1:05 pm UTC, edited 4 times in total. mathrec wrote: I would be honored to be a Knight Temporal, and doubly honored to be knighted by BlitzGirl. Sure, we could use more Knights around here! I, BlitzGirl, Knight Temporal of the One True Comic, bestow upon thee, mathrec, the Knighthood Temporal, in recognition of keen Time-related Sudoku-craft, brilliant parody of Bohemian Rhapsody, and the bravery to boom de yada while strapped to a centrifuge. Arise, and continue Waiting for it! The day/night comment reminds me. . .we've seen Cueball sleep, although Megan didn't let him sleep for very long, at least as measured in newpix. Have we actually seen anybody *eat* anything? We've seen them drink from their containers, and attempt to drink from the river, but we haven't seen anything that looks like solid food consumption. Maybe their containers are filled with a high-calorie substance or space food or something. I think they're eating a lot of the time they're sitting down during this walk portion, it's just harder to see. In the second frame of the loop tease for example, they've both got their hands to their mouths. On the beach, I think they left to eat - makes sense: sand is an untasty but insistent beach condiment. is this Newpages, or Newpix? But as we all know, you never go hungry at the beach, because... you can eat all the sandwiches there! //ducks and runs while shouting "try the veal"
Probably Newpages, because they're a better measure of how much ketchup you need. Perhaps using NP for new pages and np for new pix would help to dispel any ambiguity? This also has the advantage that for newcomer to the thread, the total number of pages (P) is equal to the total number of new pages (NP). Proof that P=NP? Last edited by Red Hal on Tue May 07, 2013 3:00 pm UTC, edited 1 time in total. Steaks, not cooked to order??? *shudders* What a Cruel and Rare punishment! Don't know how civilized, though...Well done, Lord High Inquisitor!!! Yes, we punish heretics by burning the steak at them. mscha wrote: Yes, but it's an Outside unit, making it heretical. 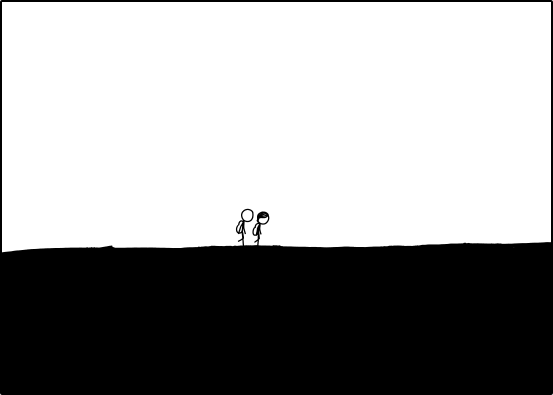 It is an xkcd unit. 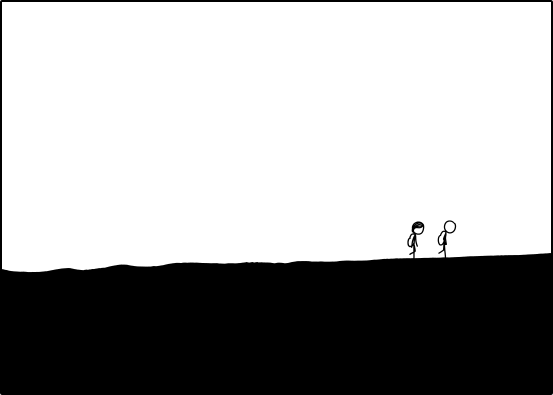 If it is outside the OTT, but within xkcd, is it still heretical? Yes. The Other Comic is not the One True Comic. ggh wrote: I think they're eating a lot of the time they're sitting down during this walk portion, it's just harder to see. In the second frame of the loop tease for example, they've both got their hands to their mouths. On the beach, I think they left to eat - makes sense: sand is an untasty but insistent beach condiment. Actually, you're right: the meatballs at Ikea are pretty good. They probably snacked while going to get poles and ropes. Ebonite wrote: Actually, you're right: the meatballs at Ikea are pretty good. Bytes wrote: Hello all, it's been a long time. Of course hats are still in fashion! Our illustrious Buffygirl made you one several newpages ago.. so go fetch it! Also not on the wiki list of hats. That is really very, very good yappo!!! I love the instrumentation and your signing is actually wonderful for the song -- understated, very on tempo, perfect inflections. I play guitar fairly decent I think, but I can't sing my way out of a wet paper bag -- compared to me, Bob Dylan, Joe Walsh, and Neil Young sound like the Three Tenors. But you have a great voice! I'd say this was a fabulous job! jjjdavidson wrote: Yappo, I somehow kept skipping over your recording. I finally listened to it, and it's charming! I hope you take it as a compliment when I say it's reminiscent of an old Herman's Hermits track. Different accent, of course, but the same optimistic, happy-with-life feeling that made them so likable. Valarya wrote: AluisioASG... maaaan. I know you warned me, but I figured it was just a normal wall of text replies. That annoying giant wall of "boom de yada's" took 22 page-downs (though why I even went to the bottom of it is beyond me. Call me a completionist.) and then 22 page-ups to hide the spoiler. Not. Cool. That's what popped into my head anyway. I haven't even heard that song in a long time, and a quick google search reveals it's 13 years older than me. Well, at least now we know why Cueball was worrying about "our rope [not being] strong enough" in his sleep. Edit: Added alt-text because XonqNopp's got a point. But I wonder how full that glass is. I call this proof that Time truly IS the One True Comic. All other comics, what-ifs etc are merely dreams of the characters in the OTC. It is known. Anyway, some really interesting developments in the OTC! I'm also thinking post-apocalypse, especially with the "tents" reference. Maybe everyone lives in tents after whatever apocalypse happened... and Megan says "not a lot of us", as if she's referring to ANY people as "us"... as if there are only a few survivors... and the fact they seem to know so little about the world certainly suggests post-apocalyptic society. mscha wrote: Yes, but [the giraffe is] an Outside unit, making it heretical. But it is written by the One True Author. That would make the OTA a heretic himself. Somehow, that can't be right. As to tents, I took it as that's just the way they live in that world. It hadn't occurred to me that this might be a camping trip. Their interaction is too matter-of-fact for this to be a special event. Gee Willikers! Out of the wasteland? So I am guessing they have been down in the flood plains of the river (and on a beach), hence no vegetation until now. It's only heresy to use Outside units within the universe of the OT[CTW]. So it's fine for our Lord Randall to use giraffes, meters, or even feet as units, as long as He doesn't do it in the OTT (where He doesn't post) or in the OTC (or in fact, if He uses them there, it would make them non-heretic). well, the Randall doesn't just create the OTC for beleivers, otherwise the OTT would be the only way to view it. Therefore, since The other comic and The OTC are put out to educate everyone and show them the way to the true faith, The Randall has introduced units of measurement that Outsiders can understand. Think of them as parables. Once The outsider has been enlightened, and no longer suffers from the scourge of Outside, then they must, of course, learn the correct ways of measuring things. This is why the OTC mentioned the heretical unit of time "days"
Last edited by Dracomax on Tue May 07, 2013 4:14 pm UTC, edited 1 time in total. Dracomax wrote: This is why the OTC mentioned the heretical unit of time "days"
No no no, you'd think a Grand High Lord Inquisitor would have a better grasp on the concept of heresy. The “days” in the OTC, 5 newpix ago, are obviously Inside days. (It's been much more than just “days” in Outside units.) So that's perfectly OK. I hope not; that would be ... trite, I think. Anyhow, the water is rising a bit fast for that to make sense in a sciencey webcomic. I really thought they just had no experience with the tide coming in, until recent newpix. Genuinely laughed out loud at that. Pure awesome. I actually got that, but again, I was making the point that Outsiders would not. Outsiders, and new initiates to the OTC/OTT can't be expected to understand the difference without instruction, and should treat the term "day" as a parable intended for those who are not initiates. Those who have studied the OTT and it's gospels will, of course, understand more fully the difference. edit: I passed 200 at some point. wonder when that happened. ucim wrote: As to tents, I took it as that's just the way they live in that world. It hadn't occurred to me that this might be a camping trip. Their interaction is too matter-of-fact for this to be a special event. Home, to me, means something more substantial than a tent. There are tents in this world, but they may be occupied2 by someone other than Cuegan. Home1 is also a reasonable possibility for where they were getting all the supplies. 3 I'd cite which newpix, but I'm not certain. In the OTT it was cited as 1093, but I'm not sure whether that was before or after the apocryphal frames were added. And I love the new info on tents and plants apparently. There is no debris like they expected, and the water tastes awful, but upstream there is vegetation. Maybe the fresh water is being stopped by a dam, and poison is released there to kill most of the vegetation. Ahh, didn't realized she'd retroactively edited that post. Apologies.. move along.